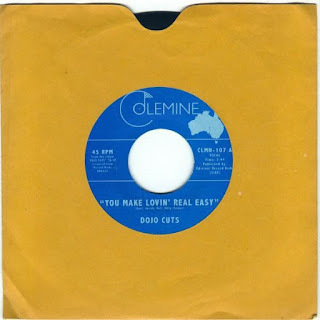 If you were wondering, like I was, what that picture of Australia was doing mashed into the Colemine logo on this single from Dojo Cuts... well, it's because Terry has gone to the other side of the earth in his search for contemporary soul and funk. If you are an exceptional case, Colemine is coming for you, geography makes no difference. This time, the Ohio based label must have been after the wakka-wakka jazzy electric funk from this eight piece and the eyes closed, clear blue pipes of Roxie Ray. on "You Make Loving Real Easy" she's the obvious focus, playing with the dynamics of her delivery, playing off the band... down in the calm, whispery quiet to matching the bursts from this substantial horn section. All in a sort of matter of fact, no nonsense style, one minute it's completely low and quivering, holding back, letting you in on this intimate moment and the next second she busts loose in a celebration of "....making love real easy" the double meaning no accident. She's a little bit on the prowl, out to go get whatever she wants with that talking wah creeping up behind her. It would be easy to focus on Roxie's expression and personality but don't overlook this great arrangement, the drumming in particular, this guy makes them really whisper right along with Roxie...there's nothing like that fade out breakdown when the whole funking thing comes back in. Teh B-Side, "Love Me Right" finds warm reverb strumming leading the intro to this one. I'm also hearing that real unique raspy, maybe Janis side, or Otis Redding when he busts out on "Try a Little Tenderness", it doesn't matter what you're into, that will change you. Every little moment she's talking about is just killing her, letting you in on this inner monologue with this kind of distance that makes you feel a little bit voyeuristic, but you aren't going to stop this midway. Huge twangy surf solo...so slow, you can hear the pick practically scraping the strings, you can keep turning this up, and when she's joined by the rising brass, no one will mind this is entertaining the whole block. I'm also really getting into these plain sleeves, the whole idea that the art doesn't even play into your impression before you play this, completely about the music. There's something pure about that idea... and these look completely timeless, like they just stepped out of a crate from the late '60s. Get down in the Colemine Records and add this one to your cart.